Summary: It’s taken me five years to realise that I have wasted my time with FCCN’s purported turnaround. The fashion chain’s latest results were very mixed, and I feel cash may now become tight if there is more bad news. I have belatedly concluded the problem Retail division could well lose money for some years ahead, while an activist investor may not be doing enough to instigate the necessary board changes. I have sold my entire holding. Last year the fashion chain published a basket-case set of H1 figures following a disastrous performance within the struggling Retail division. This time miserable shareholders were told of welcome improvements on the Retail side…but also faced shock setbacks within the Wholesale and Licensing operations. The very mixed performance meant a repeat of last year’s £8m H1 loss and net cash shrinking by £6m to £8m. Unless a swift turnaround occurs, I reckon the group’s cash position could hit zero within the next twelve months. The prospect of this hapless, loss-making business taking on debt or raising equity to fund its protracted recovery is not a pleasant one. More on that in a minute. The highlight — using the broadest meaning of the word — of these H1 results was the Retail division. Although total revenue from the group’s high-street shops fell by £1m to £42m, the associated losses were trimmed by £3m to £8m due to better like-for-like sales and the closure of five under-performing outlets. Closing five outlets was ahead of FCCN’s earlier projection of abandoning three or four stores in the current year. Another five units are set to be closed during the second half, too. However, giving me a reality check was the City presentation that accompanied these results. This presentation disclosed FCCN’s plans to still have approximately 40 UK/Europe shops left open by January 2020 (there are 69 at present). Trouble is, I am not sure whether the Retail division with 40 stores would actually break-even. So if Regent Street was losing £0.5m a year and was one of FCCN’s three worst sites, how did the entire Retail division lose £13m during the last twelve months? The answer (I presume) is that the divisional loss includes sizeable logistics, warehousing and other non-store expenditure, which will continue to occur whether there are 69 shops or 40. I have gradually realised that closing a few non-performing stores may not make much of a dent in these support costs. And so there is the real chance that the Retail division may be losing money for some years to come. Indeed, it is a sad fact that the Retail division last made a respectable profit during 2005, after which it broke even for two years and then has been stuck firmly in the red for next nine. As such, I remain convinced that shutting the Retail division entirely is the only way for the wider group to return to profitability for the long run. FCCN’s Wholesale and Licensing divisions have been reliably profitable for years and have shown that the wider group does have some sort of value. So it was very disappointing to see both of these divisions report surprise setbacks in this H1 statement. Wholesale profit dropped £2.5m to £3m reflecting some “difficult retail market conditions”, while Licensing profit dropped £0.6m to £2.4m after a licensee change caused a “short-term shortfall”. At least there is hope of rebounds at both divisions. Wholesale orders have improved during recent weeks, while the new licensee ought to bring a “long-term benefit”. 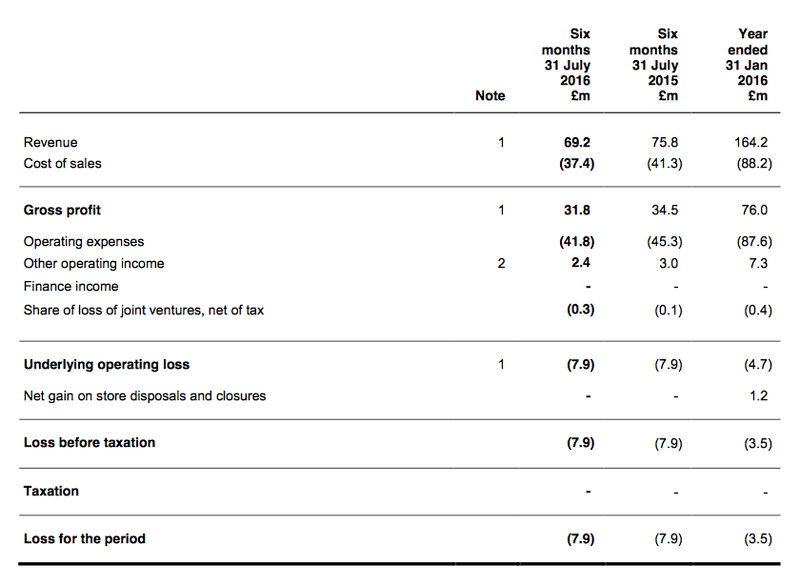 I wrote in March that “the cash position really can’t afford another £9m outflow” and here we are with these H1 results showing the cash position down by £6m. Today’s results reminded us that FCCN received £2.4m compensation for the closure of its Regent Street store in London, so in reality the underlying cash outflow was more than £8m. For the first time I can recall, FCCN has referred to “undrawn working capital facilities of £5.5m” — which I guess is to reassure shareholders that the business doesn’t have to arrange an emergency overdraft just yet. Last year FCCN’s cash pile shrank by £9m and a repeat performance during the next twelve months will see the cash pile disappear entirely. I have to admit, effectively going overdrawn is a worrying prospect for a business that has lost money in seven of the last eight years. 8% shareholder Gatemore Capital outed itself as a dissatisfied investor during the summer when it published this open letter. It appears Gatemore’s polite attempts to meet FCCN’s directors and instigate some changes have all been rebuffed. I wonder why Gatemore did not send a representative to the AGM. All the directors were present and some sort of discussion could have been pursued there. While I was pleased Gatemore has tried to engage with FCCN, I thought the investor’s remarks on the “primary issue” of gross margins were a bit fanciful. “Ted Baker, for example, achieved retail and wholesale gross margins of 64.8% and 43.8%, respectively, for FY 2016 (source: Ted Baker 2016 Annual Report). Over the same time period, French Connection’s respective gross margins were 57.3% and 32.2% (source: Company’s 2016 Annual Report). This difference of 7.5% for retail and 11.6% for wholesale is critical. Adding 5% to last year’s 46.3% group gross margin gives 51.3%… although the last time FCCN recorded that level of gross margin was back in 2007. Gatemore appeared to suggest returning to 51% group gross margins could be achieved within the next year or two by reducing the group’s large range of dresses (apparently fashion buyers can suffer from “decision fatigue”). It is not clear the extent of Gatemore’s expertise in fashion, but I reckon FCCN’s problems have been much more to do with having a consistently unattractive and over-priced product range. The issue Gatemore has skirted around in its letter is the fact that FCCN’s board requires radical changes. The retailer has recorded losses in seven of the last eight years and the two executives that have overseen this shambles — founder/chairman/chief executive Stephen Marks and operations director Neil Williams — clearly need to go. Removing them will be difficult, though, as Mr Marks holds 42% of the shares. The only way I can see Gatemore forcing the issue is to find a replacement chief executive for FCCN, seek public support from other large shareholders… and request an EGM to initiate the changes. As I see it, polite letters to FCCN HQ just won’t be enough… and private investors hoping for more may well be left disappointed. 3) Private investors wanting change need more than just polite letters — we require major shareholders to force Mr Marks out. I bought FCCN shares between July 2011 and November 2012 at an average price of 31p. After selling 28% of my holding for 62p in March 2014, I had tried to persevere with this recovery story…but I just don’t sense FCCN, Mr Marks or Gatemore will do enough to create a sustainable return to profitability in the next few years. In the meantime, there is a growing risk that FCCN’s cash may become tight and balance-sheet problems could occur. I just can’t take the chance of Mr Marks remaining defiant and taking the firm down with him. So I am out completely at 40p… and hope now to spend some time looking to reinvest in more reliable and owner-friendly businesses! I am actually surprised the share price is only down 10%. The current rate of cash burn combined with a weakness in both wholesaling and licensing suggests to me that FCCN is likely to go under within a year. The fact the company is in such a precarious situation suggests to me that any battle to oust Marks would probably only accelerate a bankruptcy. Any proxy fight at this stage will hit the short-term performance of the company, and it’s likely even if a battle was won, the new CEO would have no time to formulate a new strategy to turn the business around given the decline. It’s a horrible catch-22 situation. Considering FCCN pays no dividends and has very little capex, the cash burn speaks for itself. Looking at that, I wonder is the shrinking of the retail presence actually damaging sales and the brand of the company. According to my wife, the convenience of click and collect is a big thing for ladies these days. You can order 3-4 dresses online, collect in store, try them on there and then, and simply return the unwanted items without having to ship them yourself. If there’s no retail stores to do this, folks will simply shop at other stores like Next they provide the same service. Perhaps a moderately loss-making physical presence is required to sustain the licencing and wholesaling businesses? I am glad I watched from the sidelines on this one. Good point about a battle to oust Marks might hit the short-term performance of the company. I had not considered that. Yes, the cash burn has accelerated during the last few years and that is what worries me now. All it needs is another mishap (bad weather etc) and all of a sudden a poor H2 could see cash become very tight. Management has argued that having a retail presence highlights the brand etc. When I say I am convinced about shutting the entire estate, I perhaps should have said shutting all the standalone stores. FCCN runs several concessions in larger department stores, and the payments to hold these concessions are generally based on revenue — rather than a fixed long-term lease. As such, these concessions ought to be profitable and can be closed quickly if they under-perform. The standalone stores in contrast are subject to long and generally expense leases, which can be difficult to exit. Still having concessions could sustain the click and collect service. Something I neglected to mention in the Blog post above was that FCCN’s group gross margins have been 46-48% for the last five years. So a sudden return to Gatemore’s 52% does indeed look fanciful. Also, these latest results showed Retail gross margins stuck at 56.3% — yet last year’s H1 was a disaster and this year’s H1 saw like-for-like sales gain 6.5%. The static 56.3% gross margin therefore was an awful performance and it just seems to me there is more to FCCN’s poor margins than Gatemore’s assertion of too many dresses. FCCN has been irrelevant to young fashion for awhile. Boohoo and ASOS are eating the company’s lunch! You hit the nail on the head by suggesting closing down its entire retail division when it’s even losing money on its flagship stores on Oxford Street and Regent Street. When a company can’t even attract big tourists to their stores, it’s time to liquidate and salvage something from this wreckage. Thanks for the Comment. Yes, it does seem more people are gravitating towards BOO etc. I actually made a profit on my FCCN holding — although I can understand if my write-up suggested otherwise. I see the lease on the flagship Oxford Street store is now up for sale, expected to go for £5M to Under Armor. I wonder are we starting to get close to end game here. I am not sure whether the end game here is going to be good or bad for ordinary shareholders. Gatemore has once again skipped around the main problem — which is that Stephen Marks is way past his best and fresh executive leadership is urgently required. If Mr Marks was not a 42% shareholder, he would have been ousted years ago. Only way Gatemore et al can bring all of this to a head is to call for an EGM to oust Marks and draft in a replacement. All that could be hard to achieve of course. Notably, 8% shareholder WA Capital (owned by Will Adderley of Dunelm fame) did not sign Gatemore’s letter. I am sure Gatemore would have approached WA for a signature, so WA’s absence from the letter could be somewhat ominous. Perhaps WA is actually backing Marks? Gatemore’s reference to FCCN perhaps becoming ‘cash negative’ by the summer may be a sign the dissident investor is becoming a bit worried — although FCCN’s cash position has for some time been a bit precarious as I noted in the original Blog post above. I am not sure why it has taken Gatemore so long to highlight the cash issue. All told, I think Gatemore has to date been a little naive and too polite with its dealings with FCCN. An EGM is the only way forward. Oh dear. Christos is leaving. He was the only hope in the boardroom — a proven talent and not involved in FCCN’s downfall.